Delegating is a critical skill that all of us need to master – here’s how. We’ve all been there. As new managers moving up the career ladder, it’s normal to feel uncomfortable delegating at first. The problem is when experienced managers still don’t delegate. Not only will this stop you growing, it will also stop your team growing. Nobody wants to work for a boss who treats them like a child or who hovers over them, expecting them to mess up. The more you delegate, the better you’ll become at doing it, and the more comfortable you’ll feel doing it, because your people will grow more confident and more capable, and your fear of mistakes will fade. And according to Marcus Buckingham in his bestselling book “First, break all the rules”, there’s an added bonus to delegating: because each person has unique strengths, you may well find that your people love doing the things you hate (and are much better at doing them than you are – a win-win for everyone). This will free you up to do the things you’re great at, that you cannot delegate. The problem with perfectionists is that people don’t want to work with them or for them. Perfectionists make terrible bosses and lousy team players. Looking back to my first few years in a job, I now understand why I initially battled to move up the career ladder. I was an extreme perfectionist and a nightmare to work with. I always wanted to do everything myself, believing no-one could do the job as well as I could. My need to control everything made me my own worst enemy because I ended up working crazy hours to over-deliver. Luckily with time I’ve learnt to let go. I’m not a big fan of MBA models, as most don’t work well in the real world. But one I do believe in, which helped me outgrow my perfectionist streak, was the Pareto principle, or the 80:20 rule. In 1906, Italian economist Vilfredo Pareto noticed that 20% of the population owned 80% of the land in Italy. This gave rise to the Pareto rule. In a nutshell, this says that 80% of results arise from 20% of the causes. What does this have to do with perfectionism? It comes down to time management: if it takes 20% of your time to get 80% of the job done, the other 20% of the job will probably take you 80% of the time. So let that last 20% of the job go. For entrepreneurs, another way of looking at it is that 20% of your activities yield 80% of your revenue. So let that last 20% of activities go. 80% is good enough. This applies not only to your own work, but to the work others do for you or with you. It applies to your studies and to your personal life too. You’ll find you have so much more time to achieve so much more, without a significant drop in quality. Learning this helped me become comfortable with imperfection, because I realised just how much of my life I was sacrificing to achieve that last 20%, and it was not worth it. “It will be quicker if I do it myself.”Granted, it does take lots of time to train properly and to document well. But the amount of time you spend planning to delegate will save you much more time and work in the long run. If you train your people properly at the beginning, you shouldn’t need to retrain them, except maybe to answer questions or to remind them about a few small pointers along the way. As your team’s sense of ownership grows, they’ll take on more responsibility and take it off your hands. And they’ll start taking the initiative in ways that will really free you up your time and capacity to do the things only you can do. “I don’t want to be cut out the loop.”Shifting from specialist to generalist is tricky. And it’s painful to let go of the tasks you shone at (and that earned you your promotions). Use your know-how to guide your people, not to do the work for them. You’ll still be in the loop, but in a more strategic, macro-managing way. “But they won’t do it right!”. This comes down to trust. If you cannot trust your people to get the job done right, why did you hire them?Rather than micromanaging exactly how they do the job, show them the quality standards you expect, the logic and the end-results you want them to attain, and let them find their own way there. This is a core premise of Marcus Buckingham’s book. Be open to different roadmaps: a team member may have a different way of getting to the same end-goal, and it may even be better than your way. Let out the ropes slowly. This way you gain more confidence in the person you’re delegating to, and you learn to trust each other’s abilities to deliver. And if they do make one or two mistakes at the start, the damage on small projects and tasks will probably be minimal and repairable. As they prove themselves, give them more and more responsibility, and bigger and bigger projects. Train and support often, especially during the early stages. Work towards a happy medium between micromanaging them, which will smother them and teach them to be helpless, and letting go completely, which will leave them drowning before they can swim. Document your processes well, with lots of detail and FAQs. Not only will this cut down your time spent training. It will also make them less dependent on you and help them deliver the results you want when you’re not there. It will also ensure consistent training and transfer of skills. Take the time to show them the bigger picture. This way they’ll understand why they’re doing what they are doing and how it fits into the business as a whole. This will help them develop the executive thinking they need to grow into leaders and take initiative when you’re not around. After all, by grooming them to take over your role, you’ll be able to move up into a higher role too. Instead of coming to you for help all the time and you simply telling them what to do, ask them to come to you with potential solutions to the problems they’re encountering. They’ll learn vital problem-solving skills and the invaluable ability to make a plan. Ask your people what barriers you can help remove for them. With fewer obstacles in their way, your team will become much better at delivering the results you want. 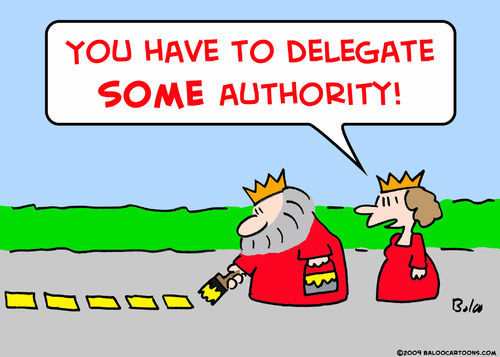 Delegating is a difficult and vital skill to get right – but once you do, you’ll marvel how you ever managed without it.